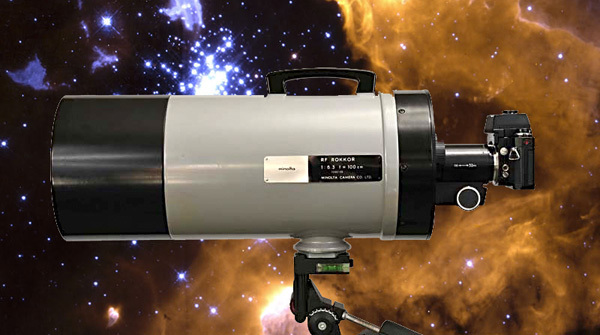 There are two main types of telescope design one being refractive and the other reflective. Minolta catadioptric design lenses simply put are compact reflector telescopes that fold the light path entering the lens. Often referred to as 'mirror' or 'reflex' lenses they incorporate the main working principle of a catadioptric telescope. They use aberrations of reflecting and refracting elements to cancel each other (kata=against, dioptric=refractive). These lenses have a fixed maximum aperture and exposure is controlled by using a combination of shutter speed and filters. In the case of analog photography correct selection of film speed (ISO) is also important. I prefer to carry a variety of neutral density and other filters with me that fit the front filter size. Changing front filters (62mm) 'on the fly' for the 250mm RF lens is more convenient in the field rather than trying to change the integral filter which requires dismounting the lens and using the filter wrench. The longer the focal length of a typical refractive telephoto lens the more weight, bulk and camera vibration the photographer has to deal with especially in the area of 300mm or greater. This is why catadioptric lenses will always remain popular despite their characteristic annular shape of de-focused areas of the image, giving a doughnut-shaped 'iris blur' or bokeh, caused by the shape of the entrance pupil. Fortunately, graphics applications such as Adobe Photoshop can easily perform background manipulation, modifying or completely eliminating this side effect. 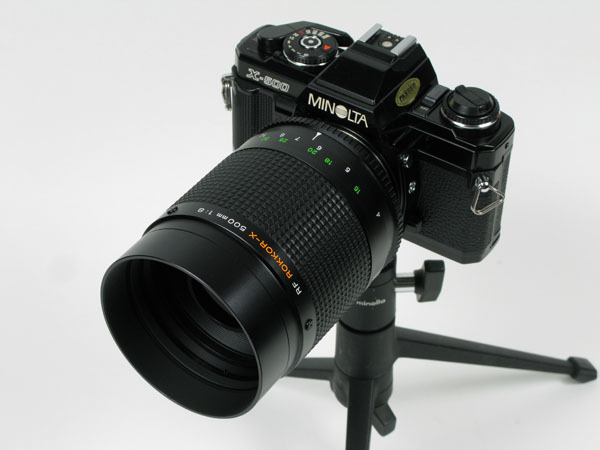 One of the most popular of Minolta's RF series lenses is the 250mm f/5.6 model. This super-compact telephoto is nearly the same size and weight as a standard 50mm lens, but with five times greater magnification. 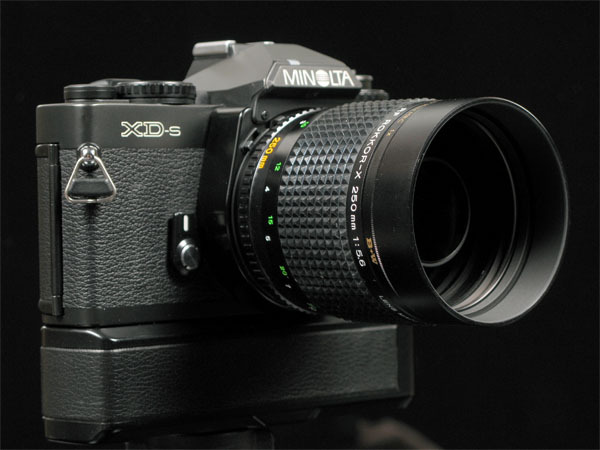 Combined with quality construction and optics, Minolta produced one of the lightest (8-13/16 oz. ), most compact telephoto lenses of its kind. One of the little quirks with Minolta's original factory 62mm diameter lens shade is that lens flare would sometimes occur in certain shooting situations. You can easily purchase after-market lens shades such as the two pictured above. 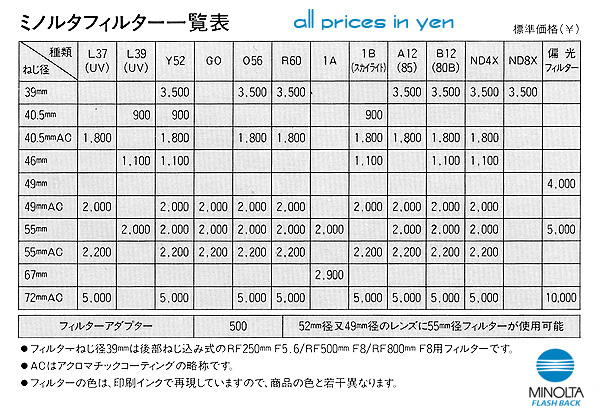 The lens shade depths from left to right are factory = 17mm; standard = 24mm; telephoto = 41mm. These measurements include thread depth. 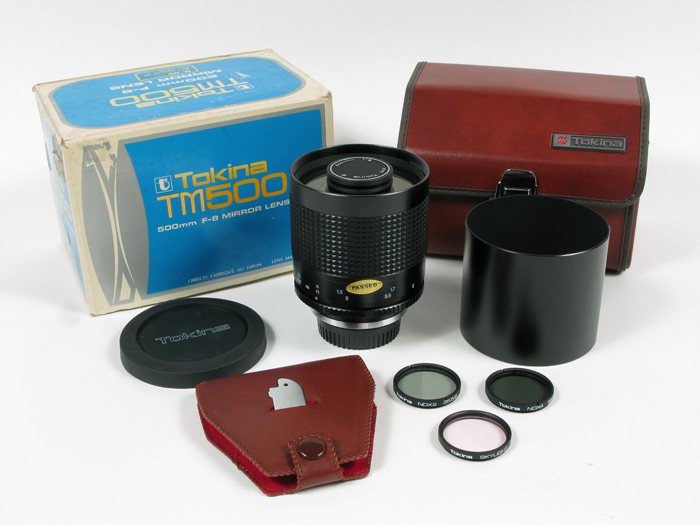 Demand for Minolta's 250mm RF lens remains high with auction 'final hammer' yielding from $500 to over $1500 for complete mint condition sets such as the one pictured above. Some of the things to look for when purchasing this type of lens are mirror hazing, mold, and element separation caused by exposure to temperature extremes and high humidity environments. Another item you want to look out for is that the 250mm RF lens comes standard with a screw-in, rear mounted integral-element type; Normal (BK-7) filter and 4X (ND4X) Neutral Density filter. Without a filter installed the lens will not focus properly. 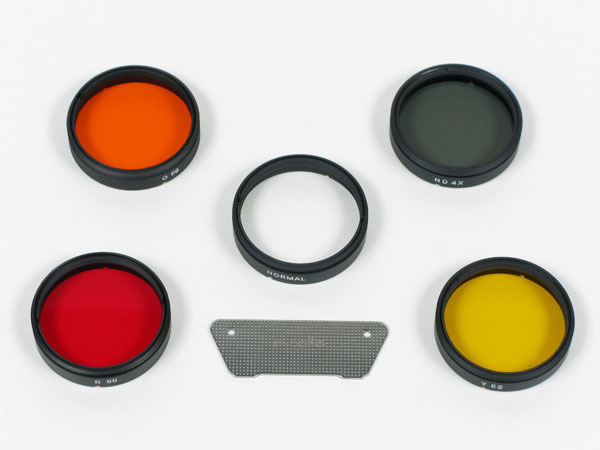 Optional filters are Yellow (Y52), Orange (O56), Red (R60), and 8X (ND8X) Neutral Density. Stopping down catadioptric lenses is accomplished by neutral density filters since these lens types do not have diaphragms thus no depth-of-field control. The ND4X filter included with the RF250mm lens reduces light by 2 stops making it an f/11 lens; an optional ND8X reduces light by 3 stops i.e. f/16. ND filters reduce light only, depth-of-field remains constant. Changes in temperature will cause these lens barrels to slightly expand or contract , The focusing helicoid is constructed so that it will turn past the distance scale's infinity mark. Thus, for precise focus at infinity, be sure to focus through the camera's viewfinder. 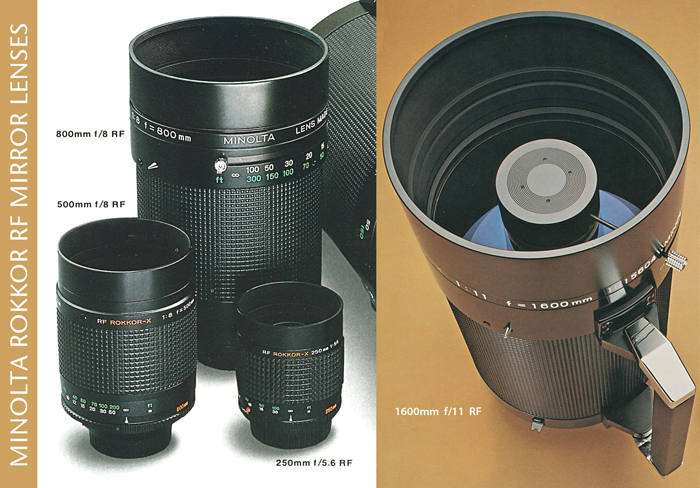 Minolta made the first truly compact 500mm mirror lens. Coming in as a close second to the 250mm RF in popularity is the 500mm f/8 RF model. The focusing method like the 250mm is accomplished by rotating the front component (lens and mirror) forward and backward by helicoid. Slightly more bulk and weighing in at 1lb. 5-1/8oz. Roughly twice the weight of the 250mm RF model, but still amazingly compact for a 500mm telephoto. Don't let its compact size fool you. With a 5 degree angle of view I strongly recommend using a tripod with this lens. These generally sell in the range of $150 to $300 depending on condition and accessories. They command much higher prices in Europe and abroad. I have two 500mm RF versions pictured above with a late model production copy on the right. 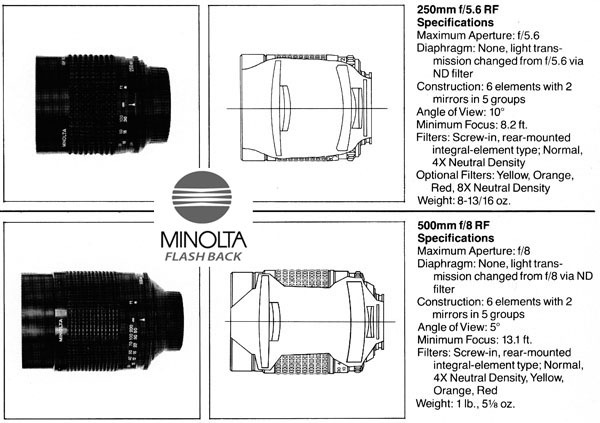 You will notice that Minolta decided to extend the standard 77mm diameter lens shade depth from 21mm to 32mm. These measurements include thread depth. This design modification was done to address lens flare that was occurring in some shooting situations. The base element design remained essentially unchanged with some slight cosmetic changes. The same basic catadioptric design has been retained throughout the years in the 250mm and 500mm RF series lenses and I haven't experienced any significant performance differences between Rokkor-X/Rokkor versions versus newer non-Rokkor production models. There may be some later minor internal design modifications, but I am not aware of such information at this time. The 800mm and 1600mm RF lenses had major design changes as we will cover later in this article. One of the most prevalent problems I find with these lenses is the lens shades are screwed in too tight. Don't try to unscrew any tight lens shade if you have to apply any significant pressure or you will most likely warp it making it virtually impossible to thread correctly. 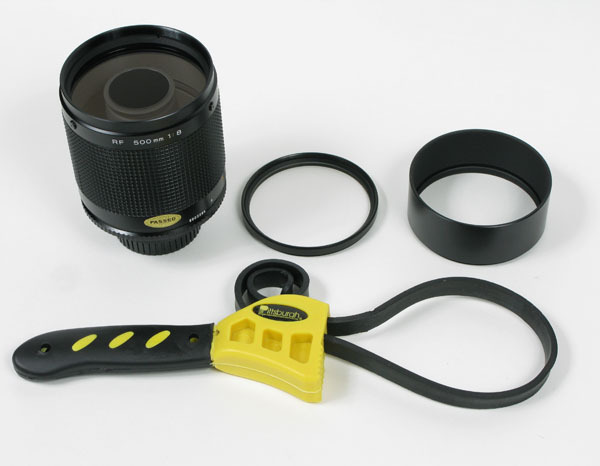 Use a rubber strap wrench like the one pictured above to carefully loosen a stuck lens shade. Make sure there is just the right amount of slack in the strap so it grips securely. Too much slack and the strap will slip marring the metal surface and potentially damage the shade. Do not use the strap wrench to tighten a filter or lens shade unless you want to damage them. Finger tighten only! Most filter ring threads are right-hand so before threading turn the filter ring or lens shade counter clock-wise until you feel the leading edge threads 'drop-in' and align. Then begin threading clock-wise. All I can say is that you learn proper threading by feel and experience. The 500mm RF model comes with five interchangeable 39mm sharp-cut back filters plus a filter wrench. Normal (BK-7), Yellow (Y52), Orange (O56), Red (R60), and 4X Neutral Density (ND 4X). The 250mm RF model comes standard with Normal (BK-7) and 4x Neutral Density (ND4X) filter. The other filters are an optional purchase. 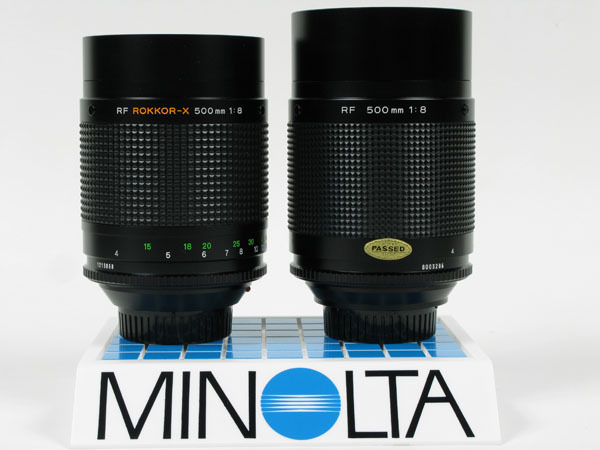 The Minolta-Tokina Connection: Tokina's counterpart to Minolta's 500mm RF was the TM500 (Tokina Mirror) lens which uses 35.5mm sharp-cut back filters as well as their AT-X 150mm and AT-X 300mm telephoto lenses. The size of Tokina's 500mm f/8 mirror lens was smaller and without the deep 70mm lens shade attached is nearly as compact as Minolta's 250mm RF model. Tokina's quality made it one of the top ranked after-market lens manufactures. Caution: Screw-in filters are integral elements of the lens and must be used for proper focus. The Normal filter is passive i.e. almost no affect on light within the path, but it does function as a necessary lens element in relation to the camera's proper back-focus. 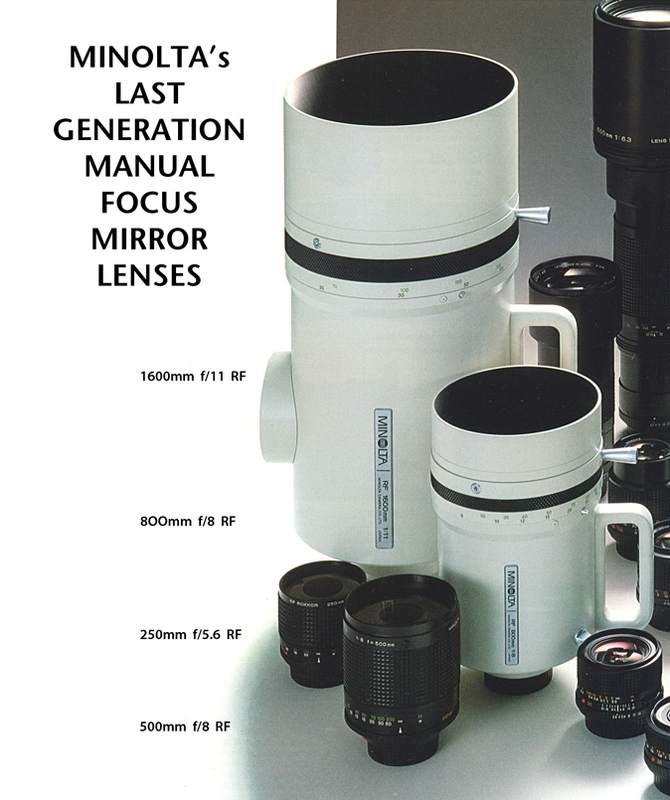 Early Minolta North American Dealer Catalogs often referred to Normal Filter Lenses as (BK-7). 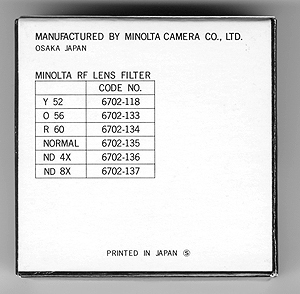 Minolta used normal quality BK7 in their NORMAL filter elements, a high quality optical glass that is used whenever the additional benefits of fused silica are not required. Since BK7 performs well in all chemical tests, no special handling is required, thus reducing manufacturing costs. It is a relatively hard material (610 hardness on the Knoop scale) with extremely low bubble and inclusion content. BK7 provides excellent transmittance through-out the visible and near infrared spectra and down to 350nm (nanometers) in the ultraviolet. Optional Filter Notes: The optional 8X Neutral Density filter (ND 8X), Minolta part no. 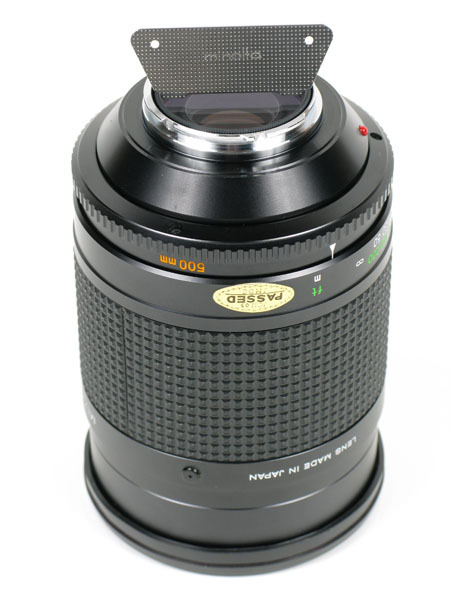 6702-137, was available via special order for the 250mm f/5.6 RF lens. Minolta did not recommend use with the 500mm f/8 RF model for obvious reasons. The other filters are interchangeable. 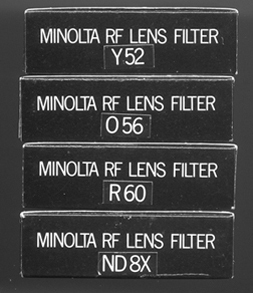 Minolta also offered an A12 (Wratten 85) and B12 (Wratten 80B) for the RF lenses, but these filters were available only in the Japanese market and not abroad. 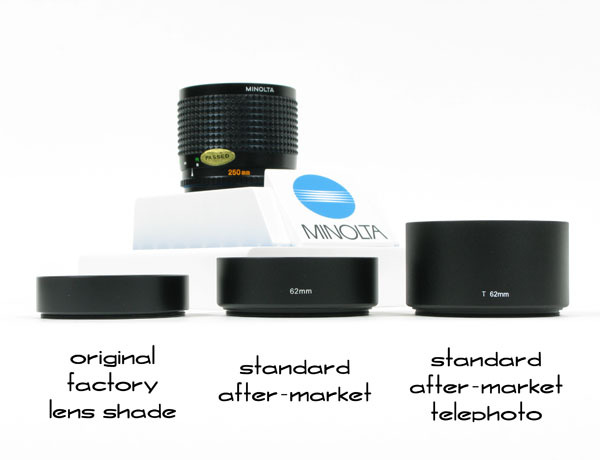 Minolta's AC (anti-reflective achromatic coating) filters were slightly more expensive and as the above table indicates limited to certain sizes. General applications for achromatic coatings were used for reducing the glare and ghost images from secondary reflections which will result in a clearer and sharper image on any optical substrate, that are necessary for camera lenses, instrument panels, binoculars, cover glasses and telescopes. Most commonly available substrate are BK7, Fused silica, Magnesium Fluoride (MgF2) and Calcium Fluoride (CaF2). 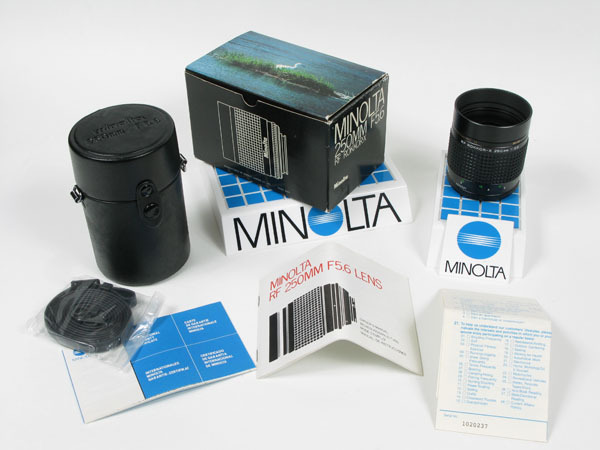 Minolta used BK7 glass in many of their common detachable filter applications. The filter wrench pictured above is inserted into the integral filter's two opposing slots and is designed to safely remove or install the filter. 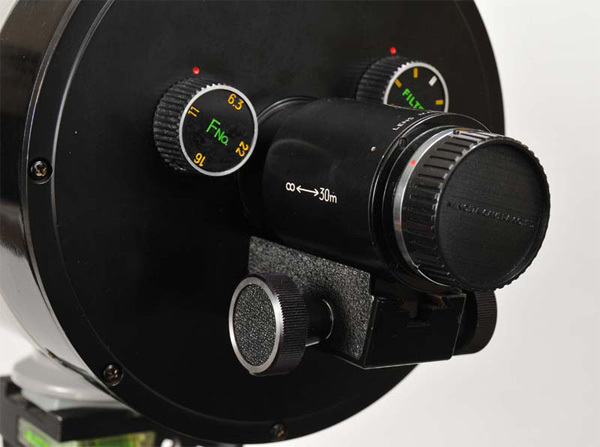 The above image shows a classic early production model of the Minolta 1000mm F6.3 RF Rokkor constructed with 2 mirrors, 7 lens elements in 6 groups. Very few Minolta collectors own a copy of this rare mirror lens. As you can see it dwarfs the XK body mounted on the rear. The lens size (217x450mm) and weight (10.6kg/23.2lb) along with a narrow diagonal angle of view (2 degrees, 30' minutes), makes mounting to a heavy-duty tripod an absolute requirement. Note: Earth's full moon is about 30' (30 arc minutes) across, or half a degree. Aperture settings for this lens are controlled by built-in neutral density filters (F6.3, F11, F16, F22) that are cemented in a revolving turret. Filter selection knobs are mounted at the rear of the tube. It also houses a built-in rear turret for detachable (insert slot) 49mm filters, Y48, O, R60. UV, and others. The minimum focusing distance is 30 meters or approximately 100 feet. Some degree of photographic skill is required before this lens can be mastered. Photo courtesy of Andrea Apra`. The optical path of the 1000mm f/6.3 RF Rokkor is shown above as light enters from left and is reflected and refracted internally. Special thanks to Minolta user Andrea Apra` (from Italy) for his contribution to this article. 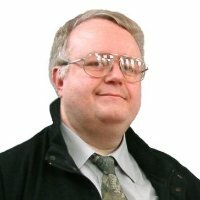 I will be adding more information in the future about digital photography applications along with Minolta's 800mm RF and 1600mm RF Mirror lenses.